One of the unique and most innovative aspects of quantum mechanics is the concept that the state of any subatomic particle cannot be known before it is measured. For instance, before we measure the position of the particle, it can be in any of many possible positions. There is a certain probability that the particle will be any of these positions. The particle may be on any point on the x-axis. Each point has a particular probability shown on the blue curve. 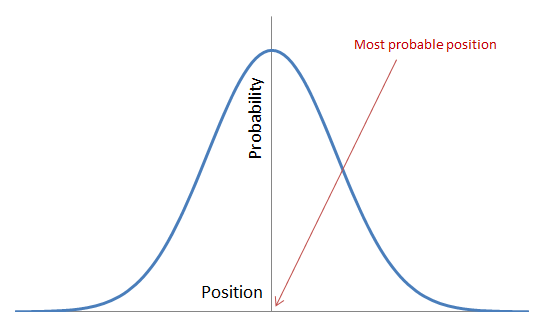 For instance, the point at which the x-axis and y-axis meet, which the red arrow points to, has the highest probability. Before we use an instrument to detect the particle, we cannot tell where it may be. It is more likely to be in certain positions than others, but we cannot be sure where it might exactly be in a particular point in time. Put differently, the particle spends different amounts of time at all possible locations, but we do not know where it is before we measure its position. When we measure the position of the particle, its wave function is said to “collapse,” resulting in one specific value. Now we know exactly where the particle is. The wave function represents the behaviour of the particle as a wave, but when its wave function collapses at the point of measurement the particle behaves, well, as a particle. This is the dual nature of the subatomic particle as both wave and particle. The mainstream interpretation of quantum mechanics considers this probabilistic, indeterministic nature and the impossible separation of the observer from the observed as intrinsic characteristics of the subatomic world. This interpretation was put forward by Neils Bohr and Werner Heisenberg during their collaboration in the late twenties of the twentieth century in Copenhagen, which is why it is known as the “Copenhagen interpretation.” It remains by far the most popular interpretation of quantum mechanics. This radical interpretation was challenged from the beginning by alternatives known as “hidden variable” theories. A hidden variable interpretation states that the indeterminacy in quantum mechanics is due to the incompleteness of this scientific knowledge. There are variables that the current theory does not consider which is why the subatomic world looks probabilistic and nondeterministic. One famous advocate of a hidden variable interpretation of quantum mechanics was Altbert Enistein who famously said “God does not play dice.” The most famous hidden variable theory is the “causal” interpretation” of David Bohm. There are two aspects of the Copenhagen interpretation of quantum mechanics that have particularly profound philosophical and epistemological implications. First, over the centuries people attributed any uncertainty about the world to their ignorance or the incompleteness of their knowledge. This applied to scientists also who always presumed that there was something they did not know whenever they could not explain a phenomenon fully or accurately. The Copenhagen interpretation is the first time in history that scientists have projected the incompleteness of knowledge of man onto the world itself, presenting this incomplete knowledge, or indeed ignorance, as complete knowledge. The standard interpretation of quantum mechanics presumes that we have discovered all the objects, properties, and laws that describe the behaviour of the components of the subatomic world, so the limited accuracy with which we can describe that world reflects inaccuracy intrinsic to the world itself, and our inability to predict its behaviour is due to its being inherently unpredictable. Hidden variable interpretations, on the other hand, follow the fundamental methodology that scientists, and people in general, always used when exploring the world. When they could not describe or predict a phenomenon accurately, they would conclude that their knowledge was incomplete or that some aspects of it might be wrong. They would never try to project that limited ability onto the world itself. The Copenhagen interpretation dealt with this change in methodology by claiming that the micro world has its own laws which are very different from those that govern the macro world. One problem is that this is just an outcome of the theory not an independent proof of it. Another is that there is no actual separation between the micro and macro worlds. Every macro object consists of micro particles. This artificial disconnect between the micro and macro worlds remains an unsolved problem for physicists who have two completely different sets of laws that describe what is effectively one world. Second, in some way, the Copenhagen interpretation made the micro world partly a product of the human activity of observation. This world is not defined completely until it is observed. What is amazing about this position is that it takes one product of this world, man, and makes him in some way its creator! Of course, man affects the world as he interacts with it, but the same science accepts that the world existed well before man. Whatever laws govern the micro, macro, or both worlds today must have been there before man existed. The fact that when we observe the micro world we disturb it and cause changes to its state does not mean that it did not have a state that could be described fully and accurately before we changed it. We just did not know it. There is one final criticism of the Copenhagen interpretation of quantum mechanics that applies to how other scientific theories are viewed. Science is a social activity that creates models or constructs to explain natural and other phenomena. Science cannot be other than a form of constructivism. Science cannot be claimed to represent pure realism. Science produces theories that are in a continuous state of change and development. This is a process of developing constructs to understand the real world. This is not the same as discovering what the world really is. This is not to deny that science has discovered a huge amount of real facts about the world, but facts alone could never make up science. In both the micro and macro worlds, when studying matter and living organisms, science combines facts with man-made constructs to produce theories and hypotheses to give a working explanation of the world. Tagged Ignorance, Knowledge, Methodology, Physics, Quantum Mechanics, Science. Bookmark the permalink.